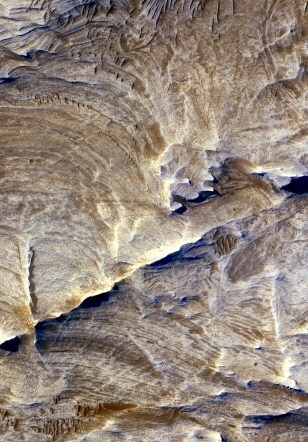 Ridges of light-toned bedrock known as "halos" remain behind as the surrounding bedrock erodes away around linear fractures in a Martian canyon known as Candor Chasma. Such features offer clues about past fluid flow and geochemical conditions within the subsurface. This image is about a half-mile (1 kilometer) across.